Sit back, grab a beverage, and let’s watch the Cubs take another series. My prediction: Cubs win the series 2 games to 1. Here’s your series preview. 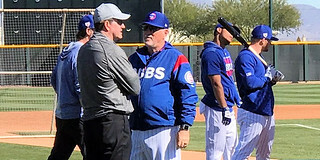 Coming off a great walk-off win on Sunday, the Cubs rested up Monday before getting ready to host the Dodgers for a three-game set, which starts tonight. We ranked each player based on their defense; take a look and tell us what you think.